BreeZBrooke -Warm and Beautiful Beach Home with a good view! Comfortable and inviting. 3 bedrooms 2 baths sleep 13. Wifi, digital antenna, outdoor shower, sheets provided. Nice, big bar. Plenty of seating. Easy walk to the beach! 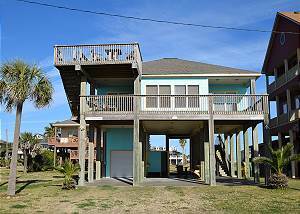 This is a 3 bedroom/2 bath beach house in Crystal Beach on the Bolivar Peninsula with great gulf views and a relaxing atmosphere. The living room provides a wall of windows that offers an unobstructed view of the beach and Gulf of Mexico. Belle Vue -Beachfront Views from this 3 bedroom, 3rd row home. Nice, quiet beach area. Sleeps 6. Outdoor bar area is great for entertaining! Sea Glass Beach House. Beautiful 2 story home. 4 bedrooms plus a loft. Sleeps 12. Master suite upstairs with Q bed & access to private deck; has satellite tv and master bath. Loft upstairs and 3 bedrooms on main level. WIFI! Great views! Sheets provided. Once Broken Deck-Spacious 2 story, Amazing View, 3 Bedrooms, 2 Baths, Sleeps 10. Our beach home retreat offers a spacious 2 story 1900 sq ft 3 bedrooms and 2 baths giving everyone plenty of space to relax and enjoy the fabulous view of the Gulf of Mexico. Luxurious Home Located in Quiet Cul-De-Sac. 3 bedrooms, sleeps 12. 1780 sq ft. open concept living area allows everyone to enjoy their time together. Living room has a large sectional couch with 3 recliners, 2 chairs and a 65 “ TV with surround sound. 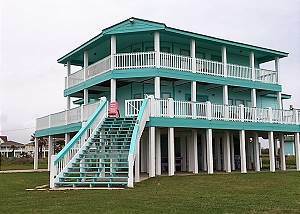 A Shore Thang - Located on the 2nd Row on a large corner lot with a beachfront view. Large families/groups are welcome. Luxurious master bath, Tiki Bar, Sand Boat, Satellite TV in every room. Free Wifi! Three stories of fun! 2 story Beach Home with Gorgeous Swimming Pool. 3 bedrooms, 2 baths, sleeps 8. Air conditioned Pool House with pool table, couch and half bath. Great Outdoor kitchen area. CraySeaGlass-Beautiful, brand new home with unobstructed Ocean Views! 3 bedrooms sleeps 12. Luxury accommodations - electric fireplace, wifi, screened in porch, satellite tv in 2 bedrooms, Gorgeous master bath with deep soaking tub & separate rain shower. Breathtaking Views from this luxurious 2nd Row Home! 3 bedrooms, 2 baths, sleeps 10. Fully stocked kitchen with large bar & lots of seating. Huge living area with views from everywhere. WIFI, Large deck, pets considered.